On 15 July 1973 the Central Bank of Yemen, when it was the issuing authority for North Yemen, issued three banknotes in the denominations of 1, 5 and 10 rials. These banknotes were complemented by a 50-rial banknote on 15 August 1973 and a 20-rial banknote on 15 September 1973. These five notes constitute the first issue by the Central Bank of Yemen, as the previous issues had been placed into circulation by the Yemen Currency Board on behalf of the Government of Yemen. The peculiar feature of this issue is the image on the front of the 5-rial note. According to the Annual Report of the Central Bank of Yemen for 1972-73, the image depicts ‘The seat of the Zabeid Government together with ornamental patterns and designs.’ Zabeid is a town between al-Hudaydah and al-Mukah in what was then North Yemen. In fact, the image on the 5-rial banknote is of a village in the Wadi Du’an in the Hadhramawt (or Hadhramaut), which in 1973 was in South Yemen – a completely separate country. The image is copied from a photograph in a book by the German adventurer Hans Helfritz, called Land Without Shade, published in 1936. That a building in another country should appear on a banknote issued in North Yemen is surprising. Most of the images which appear on the banknotes of Yemen were selected by the banknote designers from illustrations in books and magazines published in the west. It appears on this occasion sufficient care was not taken in identifying the origin of the image. The 5-rial note issued by the Central Bank of Yemen in 1973. The buildings climbing up the steep face of the hill are not found in North Yemen (the Arab Republic of Yemen). 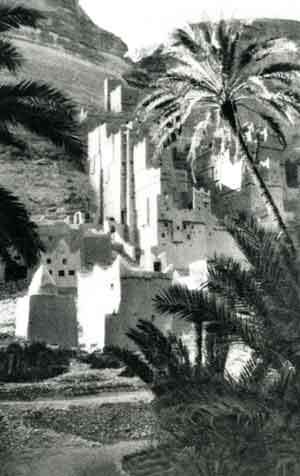 This photograph by Hans Helfritz is of buildings in the Wadi Du’an, in South Yemen (the People’s Republic of Southern Yemen), and the image was copied onto the banknote issued in North Yemen. I remember arriving in al-Hudaydah in late afternoon in a shared Peugeot taxi crammed full with qat-chewing Yemenis, exhaust fumes wafting back inside through the half open back hatch – half open due to the twine wrapped luggage and huge sacks of fresh qat in the back. It was the beginning of Ramadhan so I was desperate for a drink of water or anything, since prudence prevented the partaking of anything on the drive from Sana’a. I remember finding a rat hole of a funduq with a mattress of springs but no actual mattress. Later that evening once everyone had broken their fast, I found some kebabs and flat bread washed down with many glasses of water and juice. I expected to reach Zabeid some time the next day and I was interested and hopeful that I could find and take a picture of the ‘seat of the Zabeid Government’ taken in the same angle as depicted on the 5-rial note, P-12. Hopping into another crammed Peugeot I set off for Bayt al-Fiqh. I was mildly curious while viewing the coastal plain and waiting to see some sort of elevation ahead, since we were still under the impression that the Bank of Yemen annual report was actually correct. Arriving in a sweltering Bayt al-Fiqh I still could only view a flat plain in all directions with some well tended irrigated fields of green. The road was inland and far from the coast, you could not see the Red Sea or even hope for any comforting breeze. My tattered Michelin map showed it was only about 25km further to Zabeid so I was sure that we would be heading for some elevation or at least a lone plateau with a cliff side to match the scene on the front of the 5-rial note. If Bayt al-Fiqh was sweltering, then the approach to Zabeid was steaming hot, and I mean 'Djibouti Hot!’ Arriving at the centre of Zabeid passing many crumbling buildings and bright whitewashed mosques, I realized there is no possible way the buildings depicted on the 5-rial note could have anything to do with Zabeid. The Zabeid area is barely 50 metres above sea level. Other than a few minarets there were no tall structures. Most buildings were one and two stories. The lone exception was a five story whitewashed residence or government building with circular fortifications on two sides with an adjoining brick wall. Attached to the one side was an addition which reached four storeys. I did not find out the name of the structure but it was well maintained in comparison to all those around it. I thought the combination of the slender structure attached to the side of the taller with its pairs of windows for each floor could have been confused as looking similar to the Hans Helfritz photo, but it is a moot point after seeing the cliff or mountainside on the note and in the original picture. North and South Yemen were unified on 22 May 1990. Originally published in Germany as Chicago der wüste (Chicago of the Desert), the book was published in New York by Robert McBride and Company and in France by Editions Bernard Grasset with the title Le pays sans ombre. 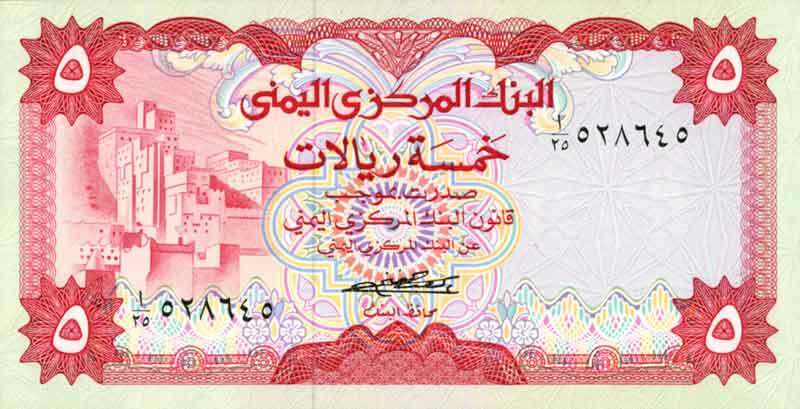 The Bank Notes of Yemen was published by the authors in 1997. A funduq is a hotel.